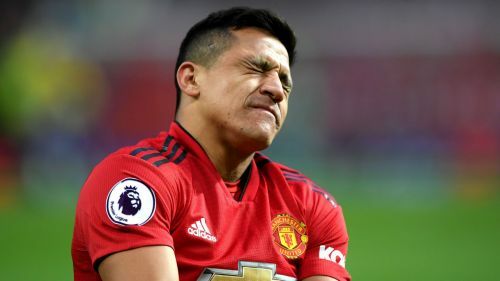 Manchester United interim manager Ole Gunnar Solskjaer confirmed Alexis Sanchez is expected to be out for between four and six weeks with a knee injury. Sanchez was afforded a rare start in the 3-2 win over Southampton at Old Trafford on Saturday, but he was forced off early in the second half after hurting his right knee in a collision with Jan Bednarek. The Chile international joined a lengthy injury list, while it proved to be another blow to his stuttering and disappointing United spell. Sanchez is one of 10 first-team players ruled out of Wednesday's Champions League last-16 second leg against Paris Saint-Germain through injury, while Paul Pogba is suspended after getting sent off in the 2-0 defeat at Old Trafford. The doctor for Chile's national team estimated Sanchez could be out for eight weeks, though Solskjaer is optimistic it will not be that long. "It was a bad knee injury, so if it is four weeks or six weeks, hopefully he will recover quickly," Solskjaer told reporters at his pre-match news conference. United's injury problems mean Solskjaer has had little choice but to once again call up several of the club's most promising youngsters, with Tahith Chong, Angel Gomes, Mason Greenwood, James Garner and left-back Brandon Williams all travelling to Paris. It is a little over three years since Marcus Rashford burst onto the scene with a brace in the Europa League against Midtjylland, and Solskjaer thinks that will inspire the youngsters on Wednesday. "I think every young player at this club is dreaming of having the impact Rashy's [Rashford] had, there are so many examples of that," Solskjaer added. "Tomorrow [Wednesday] might be a chance for some of the young ones." United go into the match with little pressure on them given the first-leg deficit and alarming list of absentees, and while Solskjaer recognises the situation, he insists there is hope. "You can say that [there is no external pressure on United], because we're 2-0 down after the home game, but we will never approach any game like that," he said. "We are expected to go out easily, but that doesn't happen with United players. Our pride was hurt in the first leg. "If we have nine or 10 players playing at their top standards, we will stand a chance. We can carry one or two. "Everyone knows we can do it, we have done it. Results in the Champions League in the last few years, I don't want to say were strange, but last year Juventus lost 3-0 to Real Madrid and were then 3-0 up in second-leg. "The year before there was PSG against Barcelona, we all remember those games. There are so many examples of teams who can change results like this. "When no one believes in you, there's always that bit of character you have to show. These players are not used to losing and we're not happy with the loss in the home leg."